Fernando António Nogueira Pessoa (b. June 13, 1888 in Lisbon, Portugal — d. November 30, 1935 in the city of his birth) was a poet and writer, seen by many as one of the most notable Portuguese authors of all time. Critic Harold Bloom referred to him in the book The Western Canon as the most representative poet of the 20th century, along with Pablo Neruda. 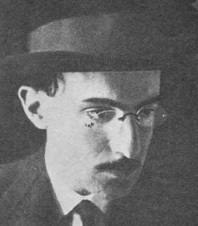 Pessoa is unique as an author due to the prevalence of heteronyms in his writing, with few of his poems being signed by himself. (excerpt from the Wikipedia entry for Fernando Pessoa). -"The magical world of Fernando Pessoa"
-A good text reviewing the "Book of Disquiet" and introducing "Message"
Years and years ago, I was visiting my beloved in Amsterdam. For no particular reason, we went one night to a little pizzeria (for the Amsterdam aficionado, it was just off the Leidseplein, but no longer exists) after having visited the Atheneum bookstore and having purchased a copy of Elizabeth Barrett Browning's Sonnets of the Portuguese. The book lay on the table, dominating it in fact, given the surface area. During a lull in the action, while she went to visit the facilities, a waiter came by, and without so much as an "excuse me," picked up the book. "Sonnets of the Portuguese, eh?" he said. "Yes," said I, always the master of a well-turned phrase. "No," said I. "They're by Elizabeth Barrett Browning. She's English. Well, she's dead now, of course, but she was English. They called her the Portuguese because she was sick a lot and had to go to Portugal to try and get better." "I am Portuguese," he informed me. "You know who is the greatest poet in English language from this century?" he asked. I paused. I was sitting in an Italian restaurant, in a Dutch city, with a Portuguese waiter who was about to tell me -- confident as I was, in the arrogance of youth, that I, long a student of English and English-language poetry, ought to know that better than he. But I couldn't resist. "Who?" said I, pleased that my linguistic flair had not abandoned me. I'm sure I must have grinned the same facetious grin shared by professors and teachers the world over when confronted by students whose "little knowledge" has turned dangerous and made them think they actually know something. "Yes," he said, mastering after a fashion my own linguistic leger de main. "Fernando Pessoa. He's Portuguese." "So," said I. "A Portuguese poet is the best poet in English from the 20th century?" At that moment, Liesbeth returned, and, probably because someone at a nearby table was in urgent need of a re-supply of garlic bread, the waiter, whose name I never did get, more's the pity, left us.